RIO DE JANEIRO, BRAZIL – Brazilian President Dilma Rousseff’s approval rating dropped twenty-seven points amid the ongoing protest movement, the largest plunge in popularity for a Brazilian president recorded in twenty-two years, according to recent opinion poll results released by Datafolha. New Datafolha poll shows President Dilma Rousseff’s popularity ratings continue to decline, photo by Roberto Stuckert Filho/PR. The opinion poll, published by Folha de São Paulo on Saturday, June 29th, marks the second month in a row that ratings have declined for the Brazilian President and her PT-led (Workers’ Party) government. 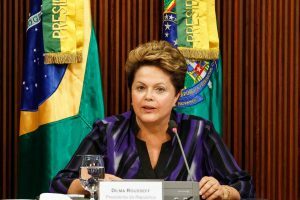 Previous survey results from the first week of June had shown an eight-point drop and at the time, represented the President Rousseff’s first major dip in popularity since she took in office in 2011. This new sharp drop is the largest decline for a president since impeached President Fernando Collor’s precipitous drop in popularity in 1990. The poll comes only a week after President Rousseff announced five “pacts” to reform the country in response to the ongoing protests. The data showed a continuing decline in popularity for Rousseff, with only thirty percent of the 4,717-strong sample of participants polled answering that Rousseff’s and her party’s management of the government was “excellent” or “good” compared to the fifty-seven percent who thought so in the first week of June. The numbers also revealed that the number of people who disapprove of the government under President Rouseff grew from nine percent to twenty-five percent in the first three weeks of June. The average rating of Rousseff also dropped to 5.8 from it’s previous 7.1 score on a 0 to 10 scale. Datafolha, Grupo Folha’s research arm, conducted the poll on Thursday, June 17th and Friday, June 28th in 196 municipalities with a margin of error of roughly 2 percentage points. Datafolha said that the decline in numbers might also be attributed to growing inflation and unemployment worries. Fifty-four percent of those surveyed thought inflation would increase compared to the fifty-one percent in the first week of June. While forty-four percent said they felt unemployment would increase this time around, thirty-six percent of those surveyed had thought so in the previous poll.